On March 5, 2012, our batch plant and shop facilities were destroyed by fire. Thanks to our dedicated staff and help from our sister companies, we were able to get back in operation and complete our contracts while we rebuilt. 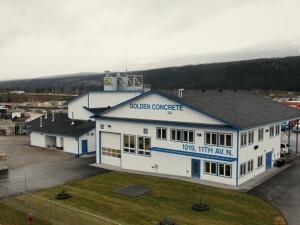 Client: Flatiron Constructors of Canada Ltd. Location: 25km west of Golden, B.C. 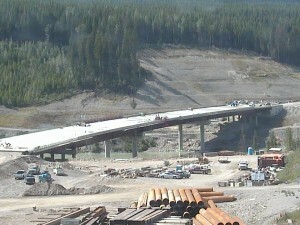 The Donald Bridge improvement was part of a large upgrade project of Trans-Canada Highway 1 between Kamloops and Golden, jointly funded by the provincial and federal government. Location: 20km East of Golden, B.C. 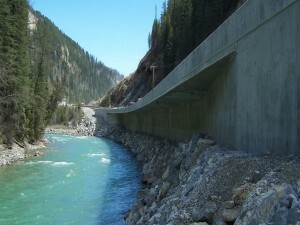 Crossing a steep ravine, the Mount Hunter Creek Bridge was replaced as part of the Kicking Horse Canyon improvement project of the Trans-Canada Highway 1. Location: 15km East of Golden, B.C. 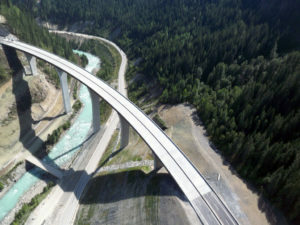 A flagship project of the provincial government, the 405m-long, 92m-high Park Bridge in Kicking Horse Canyon provides safe passage for the 2 million vehicles using this stretch of highway each year. Location: East of Golden, B.C. 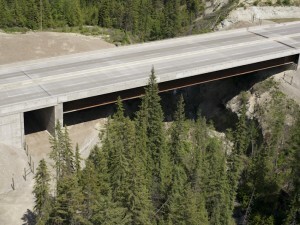 The Kicking Horse Canyon Park Bridge was replaced as part of a massive improvement project of the Trans-Canada Highway 1.